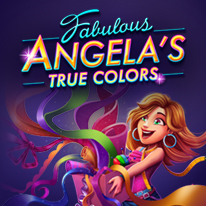 Angela's dream is to open a fashion boutique in the heart of New York's most glamorous designer area.It's nearly Fashion Week, and she's ready to shine. With new sketches in her portfolio, she’s off to find investors, who are closer than she thinks… But when reigning fashion queen Noémie hears about the hot young designer trying to take over, she sets out to destroy Angela's plans. At first Noémie's plan seems to succeed, and Angela returns home with her tail between her legs. But Angela wouldn't be Angela if she let some fading designer dull her sparkle! Your work is cut out for you. Can you assist Angela with her boutique *and* help her get into the New York Fashion Week? - Are your fingers nimble enough to defeat our exciting time management gameplay? - Are you Team Angel ?? or Team Devil ??? Which advice would *you* give Angela? - Discover two secret levels!